Adirondack Thunder players (pictured in the middle from left to right) Dylan Walchuk, Will Smith and Dillon Kelley spent the afternoon engaging with seniors and staff at the Wesley Health Care Center. Pictured from left to right: Chief Operating Officer at The Wesley Community Dutch Hayward; Director of Assisted Living Saranya Thomas; Wesley Health Care Center Administrator Jessica Florio; and Paul Florio. 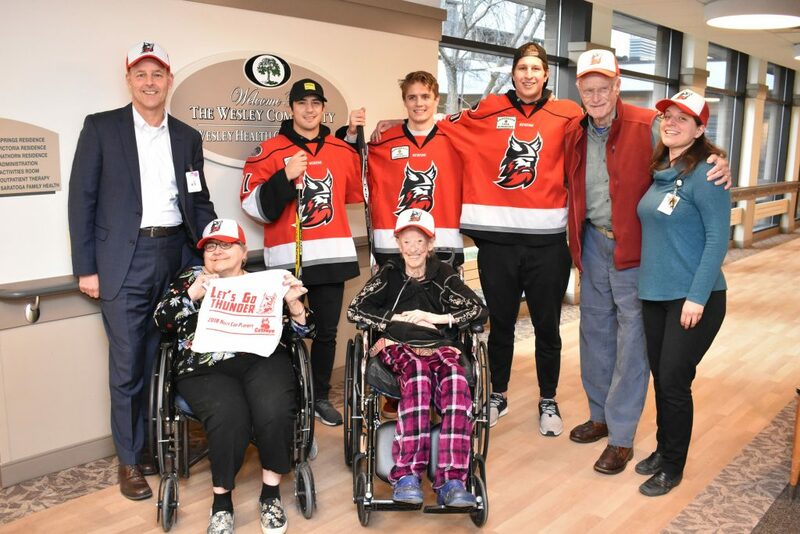 GLENS FALLS, N.Y. – The Wesley Community hosted players from the Adirondack Thunder, the ECHL affiliate of the New Jersey Devils, for a special visit with seniors residing at the Wesley Health Care Center on Tuesday, January 15. The players spent the afternoon participating in various activities and handing out Thunder memorabilia and collectible items to residents at the long-term care center. 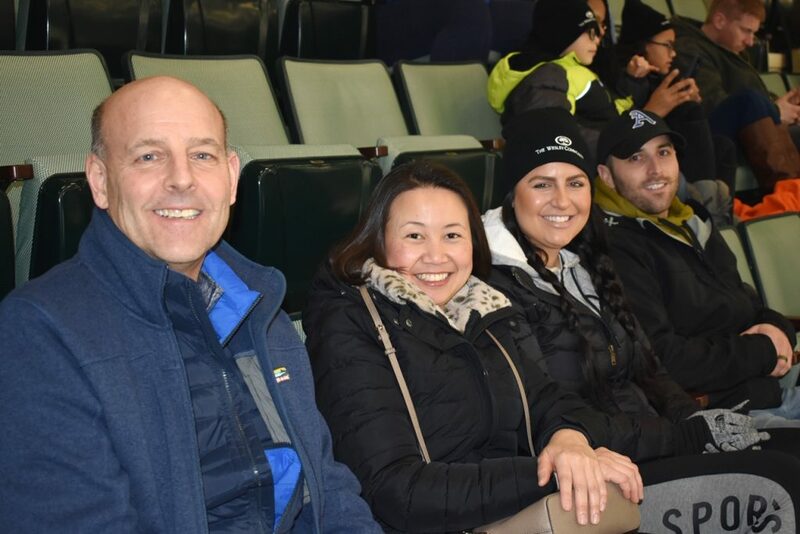 On the following day, the Adirondack Thunder in turn welcomed nearly 75 residents and staff from The Wesley Community to its home game against the Wheeling Nailers at Cool Insuring Arena. Both events are a continuation of a new partnership between the Adirondack Thunder and The Wesley Community, which also includes a new senior discount on Thunder tickets this season. Seniors ages 55 and older receive a $2 discount on tickets to Adirondack Thunder home games during the 2018-19 regular season, courtesy of The Wesley Community. The discount is available on all full-price tickets exclusively at the Upstate Chevy Dealers Box Office at Cool Insuring Arena (with valid proof of identification). Located in Saratoga Springs, The Wesley Community is a senior living campus that provides a wide range of housing, services and programs for aging adults, including independent and assisted living and long-term care. The organization also offers short-term rehabilitation and outpatient therapies for individuals of all ages. Wesley also provides home care services to clients who wish to remain in the comfort of their own residence. The home care model allows Wesley to provide quality health care and companion services in the home setting for clients in Warren, Saratoga and Schenectady Counties. The Wesley Community is a 36-acre, non-profit agency in Saratoga Springs, NY. Sponsored by United Methodist Health and Housing, Inc., The Wesley Community’s unique continuum of care community provides independent and assisted living for seniors, affordable independent senior housing, short-term rehabilitation and long-term care, as well as home care services and outpatient therapies available for people of all ages.